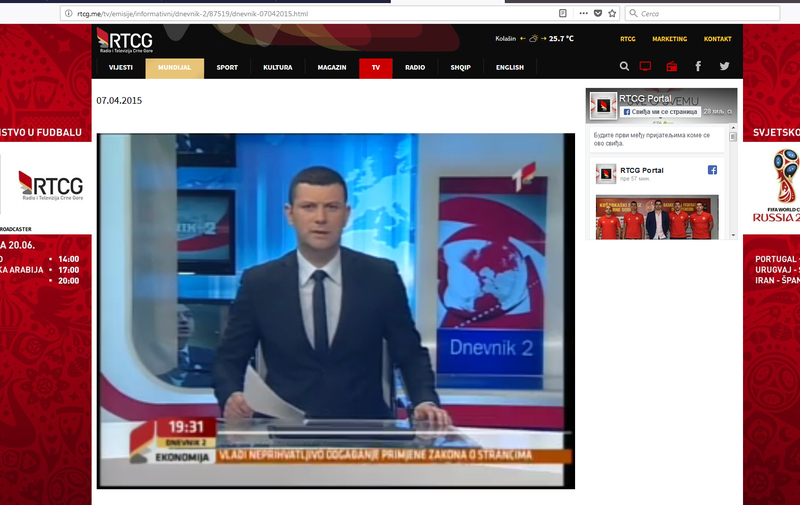 "Why did Dnevnik 2, the main news programme of TVCG (Montenegrin public television), broadcast a report where you see a member of the ruling party putting fingers in his nose?". "Why do TVCG cameramen always film leader of the Socialist Democratic Party (DPS) and President of the Republic Milo Đukanović from angles that make him look much taller than he actually is, while opposition leaders are always shot in a dark or shaded environment?". These questions – as dailyVijesti journalist and columnist Vladan Žugić reminds us – were raised some 15 years ago by some members of the Montenegrin parliament and by the members of the TVCG board during a meeting of the working group for media legislation reform, which was also attended by media experts from the Council of Europe and other international organisations. Although today the Montenegrin public broadcaster (RTCG) is formally independent of political power, the behaviour of the members of the RTCG Council remembers a lot that of those who sat in their place 15 years ago. So, no surprise if the public service still fails to fulfill its main function, that of serving the public interest. The RTCG Council recently voted in favour of removing the general director of the public broadcaster Andrijana Kadija from her position. The measure was pushed by some Council members known for their close ties to the DPS leadership: Mimo Drašković, present at every DPS rally; Slobo Pajović, DPS deputy; Ivan Jovetić, member of a committee founded by the DPS; and Goran Sekulović, author of four books that praise the political achievements of Milo Đukanović. After the removal of Andrijana Kadija, Božidar Šundić was appointed as pro-tempore director of the RTCG. Immediately after taking office, he initiated the procedure for the dismissal of public TV director Vladan Mićunović. The dismissal of Andrijana Kadija was defined by the European Commission, the US State Department, and OSCE as an attack on the freedom and independence of the Montenegrin media. The members of the RTCG Council reacted to criticism from the international community by stating that international public opinion does not have sufficient information in this regard, and that their goal is to depoliticise public service and introduce professional standards in accordance with the founding values of the European Union. Vladan Žugić is all but convinced by these statements. In his view, while they were responding to criticism by Brussels and Washington, the members of the Council branded Andrijana Kadija and Vladan Mićunović as "traitors" and instigators of a "special war" against Montenegro. "This is nothing but parroting the language used by Đukanović, which targets this way anyone who thinks differently from him. This rhetoric and the involvement of institutions that should be independent – including the Agency for the Prevention of Corruption, some judicial bodies, and the parliament – in attempts to place DPS pawns in the RTCG Council highlight two things: that Montenegrin politicians do not understand the importance of media freedom, or simply do not care; and that all the reforms adopted in Montenegro in the last ten or fifteen years are purely cosmetic", explains Žugić. Already in 2009, Podgorica weekly Monitor had dealt with the story of the public broadcaster "hostage" of the government, recalling various strategies with which the state claimed to turn the RTCG into an outlet at the service of citizens. Thus, in 2002, the new media law was approved which envisaged that the public broadcaster be financed with the proceeds of the subscription fee, in order to free itself from direct dependence on state resources. However, the citizens were not satisfied with the public service and at the end of 2008 the parliament approved an amendment to the law on public radio and television service, introducing state funding for the RTCG. "In Europe this would mean that the public service is financed by the citizens as taxpayers. In Montenegro, on the other hand, it means that it is financed by the DPS. So, this formalised what has always been known – that the RTCG is not the public service, but a state broadcaster", wrote then Monitor, also recalling that only the first RTCG Council had been elected without any interference from the government . The members of the Council were chosen from among the representatives of civil society and the parliament only had to confirm the nominations or not. Today, however, as it has been happening for years, the members of the Council are appointed by the parliament, and the parliamentary majority consists of deputies elected in the DPS ranks. The RTCG has never been transformed into a real public service, partly because, as Vladan Žugić claims, Montenegro is "a facade democracy that in the last 10-15 years, instead of progressing, has become the private property of Milo Đukanović and the DPS". As many observers have noted, Andrija Kadija and Vladan Mićunović did not make any revolution, but did take the first steps towards the transformation of the RTCG into a broadcaster able to offer objective information and operate in the interests of citizens. Also Vladan Žugić is of the opinion that the arrival of Kadija and Mićunović at the top of the RTCG decreased the interference of politics in the work of the public broadcaster, which began to give more space to the problems that directly concern the daily life of citizens, abandoning the practice of opening the major newscasts by praising state and DPS officials and broadcasting interviews in which government representatives ask themselves questions and answer them. However, as Žugić recalls, the RTCG management led by Kadija and Mićunović has also been criticised by the opposition. "Thus, for example, the public broadcaster did not report the harsh criticism expressed by some non-governmental organisations towards the government; part of the opposition (the Democratic Front coalition) complained that it did not get enough space, while Đukanović's statement accusing Vijesti of 'fascism' just because it wrote about the his son's business was only reported once the presidential elections were over", explains Žugić, adding that criticism from both political sides "is perhaps the best proof that the new management of the public broadcaster had taken the right path". But this was simply not acceptable for the Montenegrin political leadership, in power for thirty years, "because it does not tolerate any criticism, or because it fears that talking about the daily problems of Montenegrin citizens or corruption would damage it politically, or both", says Žugić, who thinks that the recent dismissal of the RTCG general director is only the latest act of a long process of decay of public service. According to him, the Montenegrin government does not understand that, in the age of social media, facts cannot be hidden. "In the absence of a serious debate on public TV on issues affecting the health system, education, the environment, the judiciary... which could lead to the resolution of some problems, today we are witnessing a situation in which social networks are flooded with requests for financial help for medical treatment abroad, stories of violence between peers, devastation of forests and coastlines, and destruction of cultural heritage. This can turn out to be a boomerang for the leadership in power. Closing our eyes in the face of increasingly serious problems afflicting citizens is always counterproductive". In April 2018, an agreement was signed between the Montenegrin government and the RTCG, which provides for 40 million Euros to be allocated in the next three years to support the public broadcaster. The NGO Media Centar of Podgorica, which has repeatedly demanded the resignation of some members of the RTCG Council, has recently sent the government a request to amend the law on the national public broadcaster in order to guarantee the independence of the public service, further requesting that the members of the RTCG Council be appointed by the Agency for Electronic Media, and not by the parliament. Media Centar believes that the current law on the public broadcaster allows the parliamentary majority to further strengthen its control over the RTCG. The Association of Professional Journalists of Montenegro (DNPCG) also supports the adoption of new criteria for appointing members of the RTCG Council, believing that the public broadcaster should be led by journalists and managers, and not by political activists of the government or the opposition. The DNPCG also argues that the Ombudsman, whose tasks also include the evaluation of RTCG's activity, should be chosen among journalists.